Most might think of brass band contests as events that occur in more northerly spots but many have been held in and around Wiltshire. In 1909 Marlborough decided to get on the bandwagon and hold such an event. Villagers nor bandsmen could have realised that they were witnessing the dawning of one of the most significant slices of the Aldbourne band’s history. The leader of our band in 1909 was the “energetic” Albert Stacey. He was a very competent and foreward thinking bandmaster it was due to his talents that his band changed its name from plain Aldbourne Band to “Aldbourne Village Prize Band”, the dawn of many contesting glories had at last arrived. On the 2nd of August 1909 we entered our first ever brass band contest. It was the second such event held in Marlborough and we were featured in the prizes and thankfully two photographs of that occasion survive. Two, because several of the bands personel had not been included with the ones that actually played. The reason might have been due to a limit on numbers but I think it more likely that some of the players were simply not quite good enough. Albert it would appear, was firm enough to tell his members that they were to be dropped for the day for as we can well see the two photographs are quite different. These photographs also contain the last evidence of the use of reed instruments for the next photo taken some two or three years later (c1912) show that they have all been removed. At last, after some fifty odd years Aldbourne had a proper brass band. A MT report tells of the build up to the event that started it all and the following week a full profile of that day’s events was printed. It all started in a July edition with an appeal by Mr AJ Crosby, chairman of the “contest and sports committee” who asked “that tradesman in the High Street brighten up their shop fronts for the forthcoming contest as 15 bands and some 300 people will be present”. Any profits were to be shared between the Savernake Hospital and the Towns “bathing place”. The venue was Furze Coppice “the time honoured enclosure”, this would appear to be the site of the present Cricket Pitch in Savernake Forest though the march contest was held down in the town where each band “accompanied by a mounted policeman” marched along the high street. We entered section two and the own choice test piece we chose to perform was titled “Water Witch”. Other bands that entered the same section were Wroughton Primitive Methodist, Lambourn, Gorse Hill, Southampton Post Office, Oaksey United from near Malmesbury, Swindon Prospect Primitive Methodist, and Wootton Rivers. The adjudicator was a military man named James Brier and in his summing up, subsequent to announcing the results he pointed out that the chief faults with the playing in the second section was the “stammering and exaggeration of dynamics” (stammering?). Anyway the result was Oaksey Utd won the march section and Southampton PO were first in the selection. We were placed second in the selection with the Wroughton band coming third. The band from Southampton was to come second in the top section held later that day and it would look like they had come to Marlborough on a “pot hunting” trip. Aldbourne folk were obviously very pleased with this result as the newspaper report the following week tells us that “the enthusiasm of the supporters of the Aldbourne Band, who mustered in strong force, was most marked, and for some minutes after the result was known the band was surrounded by an admiring crowd”. This contest was held in 1908, 1909 and 1912 but for unknown reasons we did not enter the two other times. As far as the MT is concerned this was a very barren time as few reports or mentions of our village, let alone band are to be found so the reasons for their none attendance must remain a puzzle. Later claims of contest successes indicate that we must have entered several contests but apart from a prize at Newbury in 1912 I have struggled to confirm any prize winning at all during these years. The obituary of bandsman Richard Loveday in 1918 mentions that he had been a member during many of his band’s successes but infuriatingly there is no mention of when or where these were, anyhow the Newbury contest seems to be where we gained our inaugural FIRST! prize. Anyway, imagine the honour for Albert of this occasion, returning to the village with his band’s first ever prize, surely a prouder moment he would never have. The band actually carried Albert around the square on their shoulders and the “whole village” turned out to welcome them home. The villagers of Aldbourne always showed the greatest interest in the doings of their band, but with less and less of today’s personnel now living here there is sadly a corresponding lack of support. Another example of this enthusiasm was reported on and came after a win in 1925 when the band returned late to the village and played to “hundreds of villagers”. At the 1925 Silchester contest the band entered and won both sections plus four individual medals as well. That day they performed the usual march “London Pride” and in the selection chose to play “Iolanthe”. Joe Alder won best cornet and Fred Sheppard best soprano. The writer stated that they “must be the best efficiently trained band in the country”, perhaps this was a little exageration but they really were a force to be reckoned with. One member of the once much respected Hanwell Band from London shouted from the crowd “why don’t you give them the bloody bandstand as well”. Bandsmen never show a great deal of affection for each other till after the results with everyone hoping that all the other bands will have an “off day”. In August 1925 they entered the Wednesday evening contest that was part of the Pewsey carnival week . “Purianti” was performed for adjudicator Albert Lawton from Leicester and as usual success in gaining first place was attained. Lawton said that he was not familiar with any band present and therefore had no axe to grind, he added that Aldbourne “were a long way ahead of the others”. Back in the twenty`s the band also boasted a quartet of immense talent. Molly Lunn called them the “prize winning quartet” and they often practiced in the workshop in the Jerram brothers builders yard in West Street. The quartet of the Bristol Imperial Band had been unstoppable for years until they appeared and although they used an unconventional instrumental set up to what is known as the norm, they were the ones that eventually stopped them dead! In 1950, an article featuring our band appeared in the “John Bull” magazine. In it Wilf Jerram told of the problem of sabotage to band instruments being a common occurrence and that on one occasion one of our horn players had to borrow a mouthpiece as his had gone missing. It turned up later when a rattle appeared inside his instrument and when investigated the missing mouthpiece was found. Another story was of an occurrence at the Silchester contest in 1924 when a competing band disputed our right to enter and play. There was a rule that stated that all bands should wear uniforms when on the stand. During these years we didn’t have one and so the complaint was laid down against us. A fight broke out with the drummers of both the complaining band and us, we don’t know who won the fight but we were allowed to play on. At yet another contest one of our men decided to get his haircut and thought that as long as we had a late draw he would be ok to go off to find a barber. Well you guessed it, he thought wrong and had to rush back to the contest with only half his hair cut finished. Believe these stories and you’ll believe anything but stories such as these do make for wonderful reading and I just had to include them. Having no uniform to wear during this time Bill Deacon told me that other bands called us “that rough civvy lot from Alborn”. Two photograph’s show how scruffy we looked, one of the “prize winning quartette and the other taken at a typical outdoor band contest such as Silchester or Fairford. Here would seem to be as good a time as any to cover uniforms and looking through the photo`s we can see that several sets have been purchased. As ever the present one is now showing signs of age so it was decided that 1996 would see the start of replacements on a few at a time basis as the lack of funds simply did not allow en mass replacement. In 1930 Aldbourne eventually won through to play at the Crystal Palace National championships.but it was in 1932 that it gleaned perhaps the bands greatest ever prize. That day we won the 6th section beating over 30 other bands including the Birmingham Met, Leicester and Rothwell Temperence, Hanwell from London and Morris Motors from Oxford. The 1932 photo commemorates this win showing us posing proudly with the “Iles Shield”. 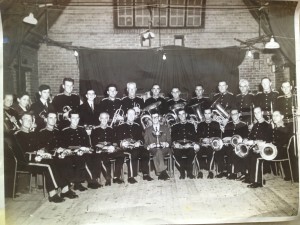 The band still tries to hold the name of Aldbourne high at the contests it enters today and the 1938 comment of “keeping up the reputation it has earned in the past” is still upheld as frequently as possible.